I was thrilled to find these gorgeous gold rush squash at our local farmer’s market this weekend. 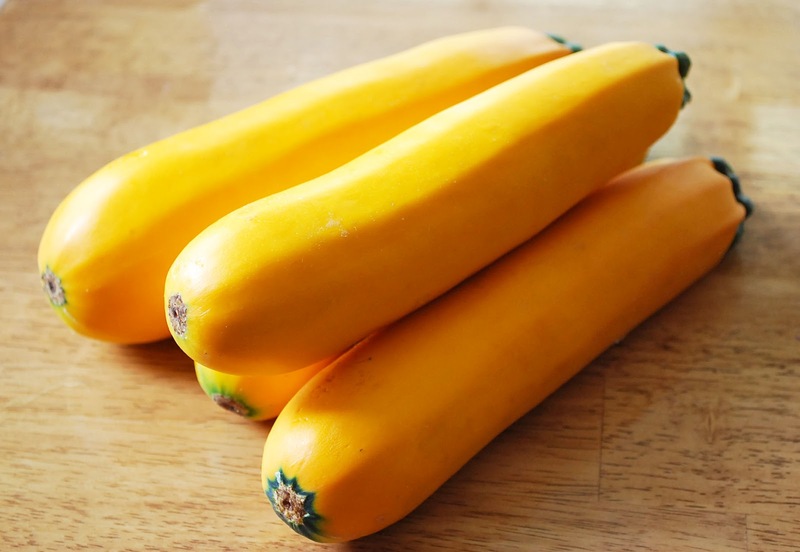 These golden beauties are actually zucchini squash. 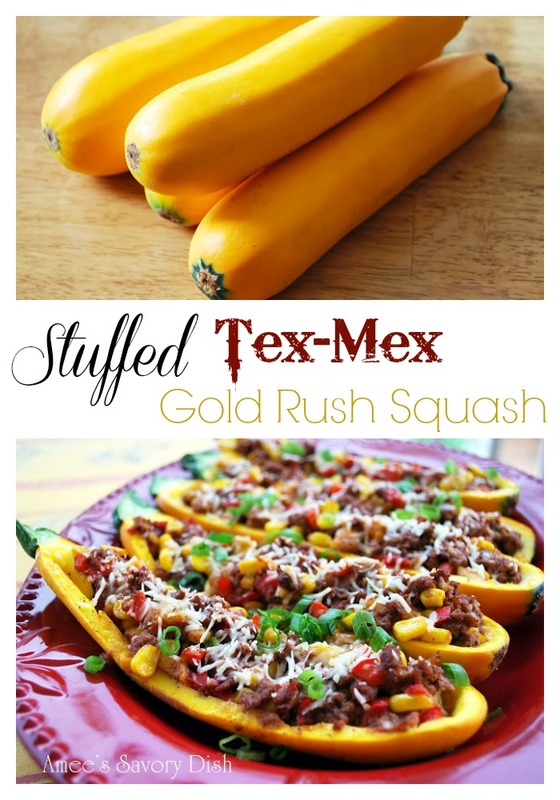 Their size and shape make them perfect for filling for this Stuffed Tex-Mex Gold Rush Squash recipe. Start with firm, ripe gold rush squash. Heat oven to 400 degrees, with rack set in the top third. Halve each squash lengthwise; slice sliver from the rounded part of each half so it sits flat. Leaving a 1/4-inch border, scoop out halves with a small spoon; roughly chop flesh, and reserve. Place squash halves, skin side down, in a shallow baking dish. Season with salt and pepper, and set aside. In a large skillet, heat oil over medium-high. Add 1/2 of the reserved chopped squash (save the rest for another recipe or enjoy it raw), bell pepper, scallion whites, and garlic; season with salt and pepper. Cook, stirring occasionally, until bell pepper begins to soften, 3 to 4 minutes. Add tomato paste, Mrs. Dash and chili powder; cook, stirring, until fragrant, 1 minute. Add beef; cook until no longer pink, breaking up meat with a spoon, 2 to 3 minutes. Remove from heat. Stir in corn and 1/4 cup Parmesan; season with salt and pepper. Dividing evenly, spoon mixture into squash halves. Sprinkle with remaining 2 tablespoons Parmesan. Cover with aluminum foil, and bake until squash is tender, 30 to 35 minutes. Uncover, and bake until top is browned about 7-10 minutes more. Garnish with scallion greens. Heat oven to 400 degrees, with rack set in the top third. Halve each squash lengthwise; slice sliver from the rounded part of each half so it sits flat. Leaving a 1/4-inch border, scoop out halves with a small spoon; roughly chop flesh, and reserve. Place squash halves, skin side down, in a shallow baking dish. In a large skillet, heat oil over medium-high. Add 1/2 of the reserved chopped squash (save the rest for another recipe or enjoy it raw), bell pepper, scallion whites, and garlic; season with salt and pepper. Cook, stirring occasionally, until bell pepper begins to soften, 3 to 4 minutes. Add tomato paste, Mrs. Dash and chili powder; cook, stirring, until fragrant, 1 minute. Add beef; cook until no longer pink, breaking up meat with a spoon, 2 to 3 minutes. Stir in corn and 1/4 cup Parmesan; season with salt and pepper. Dividing evenly, spoon mixture into squash halves. Sprinkle with remaining 2 tablespoons Parmesan. Cover with aluminum foil, and bake until squash is tender, 30 to 35 minutes. Uncover, and bake until top is browned about 7-10 minutes more. 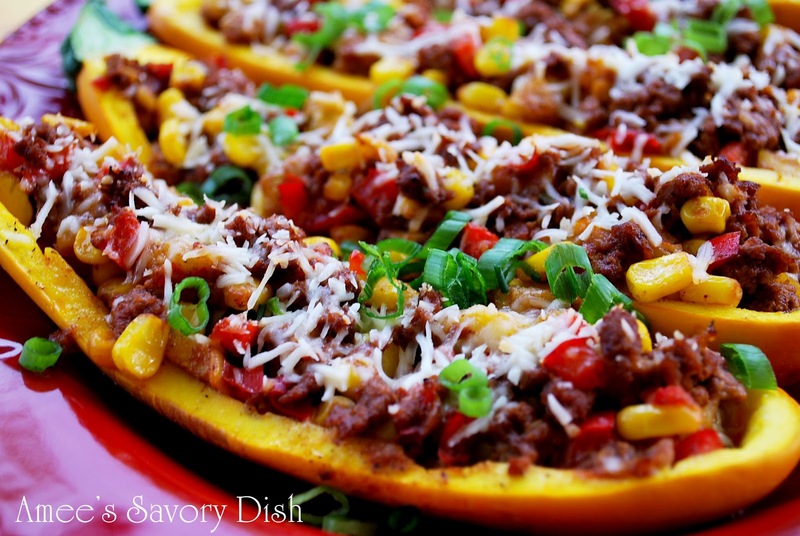 These tasty Stuffed Tex-Mex Gold Rush squash boats make a perfect, protein-packed, summertime meal! Beans work as a great substitute to make this a vegetarian dish. I’m going to try black and kidney beans! Ohhh how pretty and what great flavors! I’m glad your daughter liked this and I know my hubby will! Thanks! Thank you Sonali!! 🙂 Jill, I hope your hubby enjoys these. We all loved them in my house. It’s a keeper when the kids ask for seconds. I love the idea of substituting beans in this dish! I’d love to hear how it turns out. Sounds delish! What is gold rush squash? Is it the same as a yellow squash?